It would be easy to get lost in the trackless marshes east of Fort Blueblood, on the nebulous border between Blackwood and Argonia. Easy-and probably fatal. 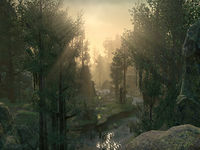 Blackwood Borderlands is an area between Blackwood in Cyrodiil and western Black Marsh. 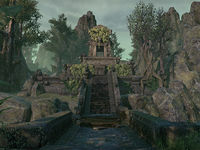 An abandoned Dark Brotherhood sanctuary can be found there, within the ruins of Xith-Izkul. You will travel to Blackwood Borderlands with Green-Venom-Tongue to find out what happened at his old sanctuary. Kotu Gava and Haj Mota can be found in the exterior swamps, as well as harmless frogs and snakes. This page was last modified on 19 November 2018, at 06:53.